From 12 pounds to 42 pounds, accurate and repeatable tamping force, precisely measured, now in the palm of your hand! Control that last variable with Smart-Tamp, the electronic, calibrated espresso tamper. 58 mm base. There are numerous variables when making espresso. That's just a fancy way of saying that there are lots of ways to make bad espresso. We try to control the process by adjusting the grind, weighing how much coffee to use each time, how long to let the water flow through the coffee, making sure that the coffee is properly distributed before tamping, and the force used to tamp as well. One parameter that is often overlooked is tamping force accuracy. Some have even resorted to using a bathroom scale to measure tamping pressure. Advice for exactly how hard to tamp is widely available. How hard to tamp? What it too hard? Too soft? Having one answer to these questions is not realistic. What if you want to grind a little finer, use a little less coffee, and instead of tamping to the “recommended” 30 pounds, you want to use 22? Or maybe 20? What if there was a sanitary way to instantly and accurately know how hard (or soft) you are tamping, in real-time, with electronic precision? THERE IS! The “Smart-Tamp” from M-G Coffee Tools is the answer! M-G Coffee Tools has created the Smart-Tamp. This high-tech device is, appropriately enough, created at the Mojave Spaceport in California. 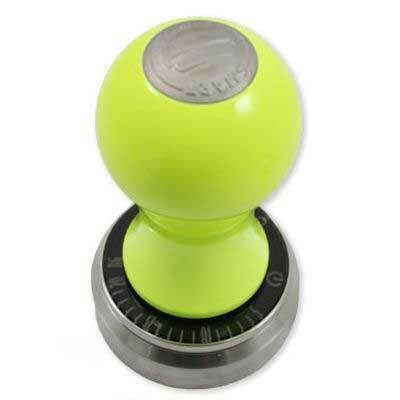 This calibrated espresso tamper has a proprietary strain gauge inside that measures the amount of force you use and displays it on its base using a series of LED-illuminated numerals and tick marks. As you press harder, an LED illuminates one mark on the scale indicating the force you are using in real time. The response is very fast so that you know exactly what is going on, right now! Helps avoid “over-tamping” which can lead to repetitive stress injuries. “Zeros Out” each time it is turned on for accuracy. No user calibration or adjustment is necessary. Just turn it on and tamp! Batteries are easily changed on the Smart-Tamp calibrated espresso tamper. They snap into a high-quality battery case under the base. The base is O-ring sealed to the handle assembly to protect the batteries and their holder from moisture, corrosion, and coffee particles. 1st-In Coffee is currently offering the 58mm version which is calibrated in pounds. Includes two 58mm bases – a standard flat as well as a convex curve. The bases which screw onto the handle unit are easily and quickly interchangeable without tools. Indicators for 12 to 42 pound tamping force in two-pound increments. 16 tamping choices instead of just one! Pick up a Smart-Tamp calibrated espresso tamper today and have one less thing to worry about, and be one step closer to excellent espresso!